NICCONI (AUS) (Bay 2005-Stud 2010). 6 wins-1 at 2, VRC Lightning S., Gr.1. Sire of 191 rnrs, 129 wnrs, inc. SW Faatinah (SAJC Euclase S., Gr.2), Chill Party, Nicoscene, Concealer, Ayers Rock, Exclusive Lass, Loved Up, SP Bolero King, Caipirinha, Niccolance and of Hear the Chant, Nicconi Leggera, Backstab - Beauty Master (H.K. ), Quatronic, Fusina, Adventurer, Ballybrit, Burgundy Lass, Graceville, Niccoco, Sonic Swish, State Solicitor, etc. SPECIALISOR, by Don Eduardo. 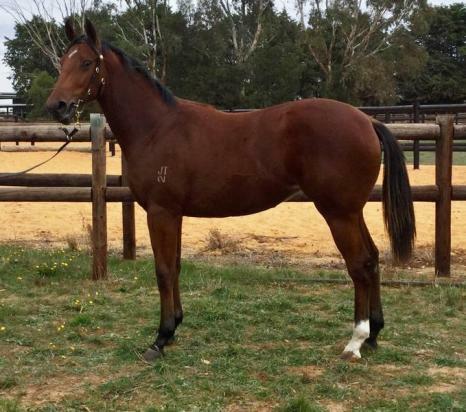 2 wins at 1600m, 2d SAJC Coffee Club P. Half-sister to DEMOGRAPHIC, Chalonnaise. This is her second foal. Her first foal is a 2YO. DEMOGRAPHIC (Gold Brose). 4 wins to 1400m, A$199,050, VRC Frances Tressady S., Gr.3, MRC Love a Show H., December H., SAJC Nuclear Debate H., 2d SAJC New Year's Gift, L, VRC Maybe Mahal H., MRC Highways Tabaret H., 3d VRC Mark Sensing H., MRC Regal Vista H., 4th SAJC Swettenham Stud S., Gr.2. Producer. Chalonnaise (Gold Brose). 2 wins-1 at 2-at 1000m, A$88,480, MVRC Samboy Maxican Mayhem H., SAJC Danzig Connection 2YO H., 2d MVRC Cathy Freeman Flying H., MRC Our Faith H., SAJC Castle Tavern H., 3d SAJC Smoke-Free SA S., Gr.3, VRC Red Roses S., L, VATC William Inglis H., MVRC Great Race H., Oakbank RC Yalumba Shillabeer P. Producer. Enzedbee. 3 wins-2 at 2-to 1400m, Rotorua RC Carson Taylor Ford 3YO H., Hawke's Bay Charlie Fergus Juvenile H., 3d WRC NZ Bloodstock Bonus 2YO H. Producer. Step Right Up. Winner at 2, WATC Westspeed Nursery H., 2d WATC Dee Dee's 60 H., Rotary Club of Perth H., Tabtouch With Cash H.
SPECIALIZE (Bluebird). 6 wins to 1350m, A$158,608, AJC June S., L, STC Port Jackson Flying Welter H., Saratoga H., Londonderry H., Leopardstown H., 2d STC Civic H., L, 3d NSW Tatt's RC Carrington S., L, Gosford RC Pacesetter S., L. Sire. BOMBER BILL (Air de France). 23 wins-7 at 2-to 1400m, A$1,892,330, MVRC Australia S., Gr.1, SAJC Goodwood H., Gr.1, WATC Karrakatta P., Gr.1, AJC Challenge S., Gr.2, MVRC Schweppes S., Gr.2, AJC Liverpool City Cup, Gr.3, VRC Gilgai S., Gr.3-twice, MRC Rubiton S., Gr.3, SAJC DC McKay S., Gr.3, RN Irwin S., Gr.3, WATC Sires' Produce S., Gr.3, 2d QTC Cup, Gr.2, MVRC Schweppes S., Gr.2, VRC Bobbie Lewis H., Gr.3, MRC Rubiton S., Gr.3, 3d QTC Cup, Gr.2. CAMARGUE (Air de France). 2 wins-1 at 2-at 1050m, 1400m, A$110,550, VATC Thoroughbred Club S., Gr.3, SAJC Balcrest S., L, 3d SAJC Breeders' S., Gr.2, VATC Veuve Clicquot S., L. Producer. SPECIAL SONG (Song of Tara). 11 wins-1 at 2-from 1000m to 1800m, A$282,800, Qld Tatt's RC Members Cup, L, BTC Document Destruction H., QTC Easter Cup, Romantic Dream H., BTC Alex J Saunders Valuations H., 2d BTC Bernborough H., L.
KURO (Denman). 6 wins-1 at 2-to 1200m, A$472,400, to 2014-15, ATC Heritage S., L, Brian Crowley S., L, 2d ATC Galaxy H., Gr.1, 3d VRC Coolmore Stud S., Gr.1, BRC QTC Cup, Gr.2.